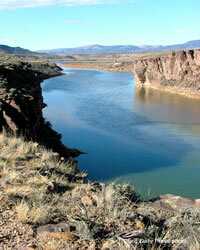 Browns Park National Wildlife Refuge lies on the Green River covers more than 13,000 acres. It is managed by the U.S. Fish and Wildlife Service as a refuge for migratory waterfowl, as well as wintering elk and deer. 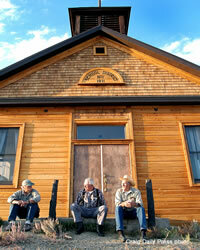 Browns Park was a favorite wintering place for Ute and Shoshone Indians, mountain men and cattlemen. Later, because of its remoteness and easy access to three state borders, "Browns Hole" became a haven for outlaws such as Isom Dart, Matt Rash, Annie Basset, John Bennet and others. The refuge is home to approximately 200 species of birds. About 300 goslings and 2,500 ducklins hatch there annually. Bald eagles may be observed in the winter, while peregrine falcons and golden eagles are seen soaring over the refuge in the spring and summer. Caution: This area is remote and services are limited. To get there, travel west from Craig on U.S. Highway 40 to Maybell. Turn right at Colorado Highway 318 and follow the signs. Approximately a two-hour drive. 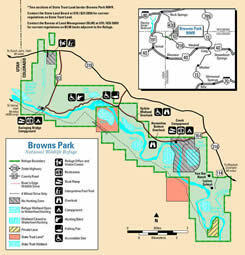 Fishing, hiking, mountain biking, river floating, camping, OHV. 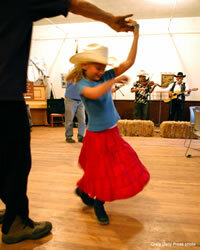 See our Camping guide for more information about site amenities and other camping options.